I’m using GIMP and G’MIC for a long time. In this version, G’MIC is 2.4.5. I try to manually install last version in Linux (it’s OK on Windows), but I can’t. Any idea ? Any method ? Thank you for your support and for this work. @Krol Welcome to the forum! Did you download from https://gmic.eu/download.shtml? Try the GIMP AppImage. It should include the latest G’MIC. See GIMP AppImage (continuous integration) and Community-built software. It is a QT issue. Both zips from www.gmic.eu (Debian sid / 'buntu-cosmic) require a more recent QT than is available. gmic_gimp_qt needs to be compiled against an older QT5. This works in a Mint 19 VM Gimp 2.10.8 from the otto-kesselgulasch/gimp PPA. The usual: uninstall the old gmic_gimp, unpack the zip, put gmic_gimp_qt-mint19 in ~/.config/GIMP/2.10/plug-ins, check the permissions. In addition, I would be inclined to rename the old gmic profile ~/.config/gmic as a back-up and start afresh. Which Linux version are you using? This is ok. Could you start the AppImage from the terminal, and post the output? @Krol Could you try to run the latest GIMP 2.10.10 AppImage, and install the latest G’MIC plugin following the instructions from here? 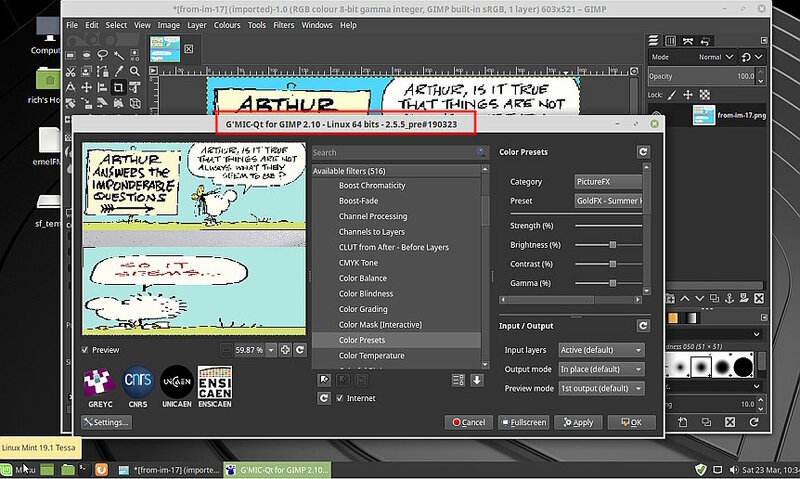 This is now the recommended method to use G’MIC with the GIMP AppImage. Let me know how it goes, and I will be happy to help you further.